There’s nothing quite as satisfying as digging into a good ol’ fashioned shrimp boil. Veggies, shrimp and andouille sausage swimming in butter and seasonings create a hands-on feast that’s finger licking good. 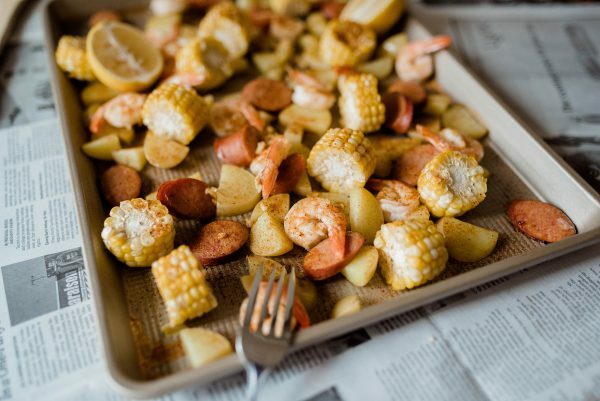 Our One Pan Shrimp Boil recipe brings it all together, giving you all the Cajun feels without the fuss. The key to this recipe’s authentic flavor comes from andouille sausage, which is smoked pork blended with Creole seasonings. It’s a home-grown favorite with Southern flare. While you may know that the 1.2 million pigs raised in South Dakota annually eat a healthy diet that includes soybeans, you may not realize that shrimp and other fish enjoy soy too! In fact, a South Dakota-based company, Prairie AquaTech, uses soybeans to create protein-dense pellets to feed farm-raised fish. Who knew soul food on the prairie could taste so good? Watch and learn how to create your own one pan shrimp boil for your next family meal. Scroll for full recipe below. Curious about other foods that’s are grown and raised in South Dakota? Let’s take a look at a few that may surprise you. Preheat oven to 400 F. Spray baking sheet with nonstick spray. In large pot of water, cook potatoes about 10-15 minutes. Stir in corn during last 5 minutes of cooking time. In small bowl, combine butter, garlic and Old Bay Seasoning. Place potatoes, corn, shrimp and sausage in a single layer on baking sheet. Pour butter mixture over ingredients and gently toss. Bake for 15-20 minutes, or until shrimp are fully cooked.